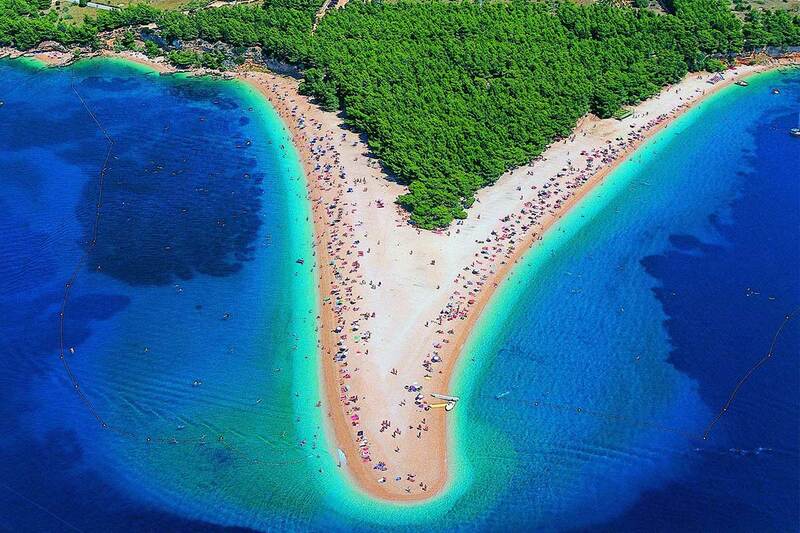 Zlatni Rat (Golden Cape) is probably the most popular beach on the Adriatic is located in Bol, on the south coast of the island of Brach. Zlatni Rat is one of the largest and most attractive places of natural beauty on the Adriatic coast and a symbol of Croatian tourism. The white pebble beach stretches into the open sea and changes its shape according to the direction of the wind and the waves. The clear blue sea surrounds an almost half kilometer long and narrow pebbled promontory which is partly covered with green forest, a natural protection from the very strong sun. When the winds blow, Zlatni Rat becomes a real surfing paradise. The largest part of this amazing river’s course is the national park, which in addition to its natural phenomena abounds with cultural and historical monuments. The most outstanding of these is the Franciscan monastery on the tiny island of Visovac, set in the middle of the lake widening in the river like a precious stone. Within the monastery there is a picture gallery and a church, origins of which are traced back to the 14th century. In the middle of the canyon, upstream of the river, is an interesting Krka Orthodox monastery; while on the high ground above the river several old ruins sit. The old mills, which have been transformed into small ethnographic museums where one can see how wheat was ground in the olden days, are a popular attraction for visitors. Heritage interpreters are dressed in traditional folk costumes, which is particularly interesting and entertaining for children, who are frequent visitors of the park. 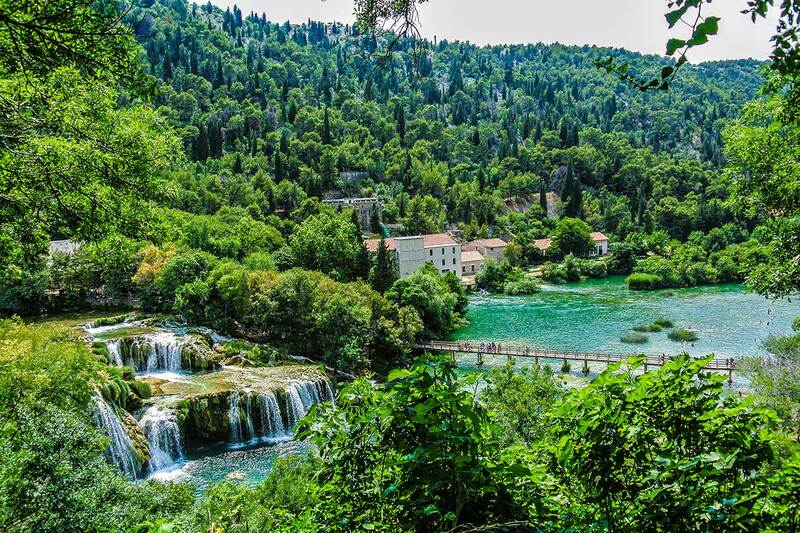 However, the main attraction of Krka National Park lies in its seven waterfalls. The widest of these is „Roški slap”, although „Skradinski buk” is the biggest and most well known. 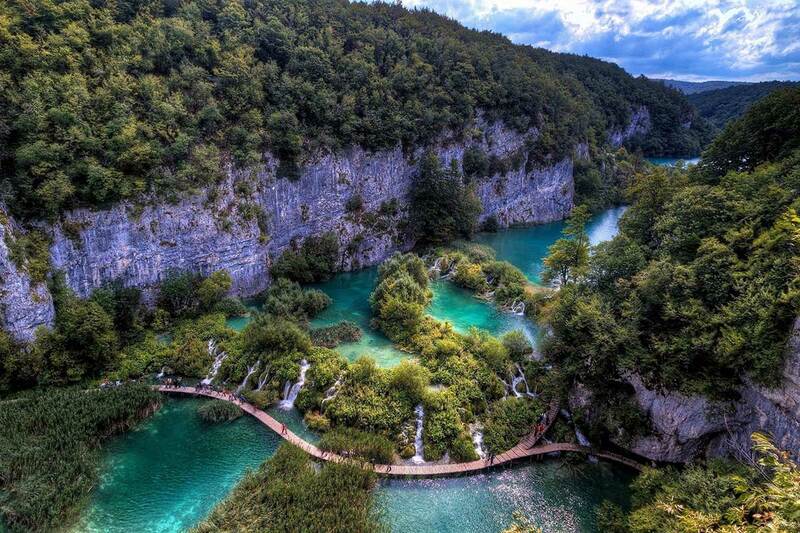 This is Croatia’s best known national park and the only one of eight that is listed on the UNESCO List of World Heritage sites. The main attractions of this park, unique in the world, are the 16 small lakes joined by waterfalls created by the sedimentation of travertine, a special type of limestone. This national park encompasses the source of the river Korana, located in the area surrounded by dense forests of beech, fir and spruce. There are also several caves in the park, as well as springs and flowering meadows. The brown bear stands out as one of many protected animal species. The popularity of this park is also boosted by the special means of transport used to ferry visitors around: the panoramic electric trains and the noiseless electro-powered boats. It is impossible to say whether the park is more beautiful in the spring, when the flowers in its meadows are in full bloom and when the trees have turned green again, or when the riot of autumn colours is reflected in the waters of the lakes, or indeed during the winter calm, when ice petrifies the waterfalls and when the surrounding trees are heavily laden with snow. By a network of paths, visitors can get around and access the numerous waterfalls and the rocky lake shores easily. 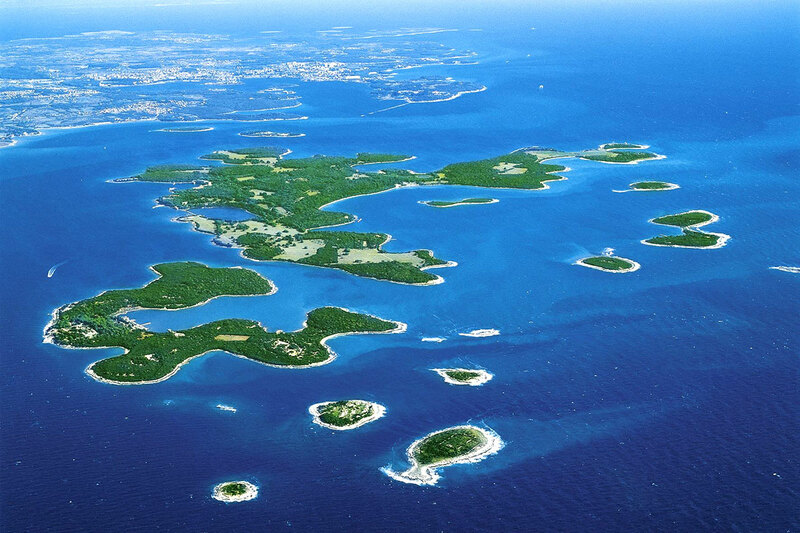 Brijuni, a group of islands comprising of two large and twelve smaller isles, are strung along Istria’s south western coast not far from Pula. Their surface area is barely 7 km2, but together with the surrounding sea the total area of the park is 34 km2. Brijuni are renowned for its indented nature and the unspoiled Mediterranean vegetation, but the islands also boast an invaluable cultural heritage dating from the Roman and Byzantine times, which alongside with the outstanding natural beauty, has made them a popular holiday destination among the world statesmen and the aristocracy. Bjijuni became famous as the private retreat of Tito before being accorded national park status and opened to tourists in 1983. The site of the first golf course in Croatia is on Brijuni. Despite the numerous visitors, the landscape has been well preserved, as proved by a large number of birds which winter on the islands.